Remember Married With Children? More precisely, do you remember how Al Bundy used to live in his college football glory days, oblivious to the pathetic heap of flesh that he had become? 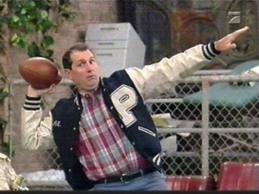 Well, call me Al Bundy. True, I'm not married and I don't have children but, somewhere during the last year, my perceptions about my athleticism and my actual athletic performance drastically parted ways. After a 14 month hiatus from the recreational racing circuit, I signed up for the Kootenay Krusher, a 50km enduro that took place near Nipika Resort in BC. Sure, I could have chosen a more gentle entry point into the circuit than a five hour bone rattler. But then, I've never been one to pick the easy way. For the first 10km, I felt like a superhero. Back in the New York Groove. Then I did an endo on…I don't even know what. Somehow, I saved myself from mashing my teeth into the soil, but I was unable to escape skinning my upper lip (that scab moustache I'm left with looks really pretty). I salvaged what was left of my pride from the forest floor and carried on for the last painful 80% of the course. Eventually, I dragged myself across the finish line just in time to get one of the last burgers on the BBQ. It was a miracle that I had any room after gorging on such a huge serving of humble pie. Welcome back to cycling.